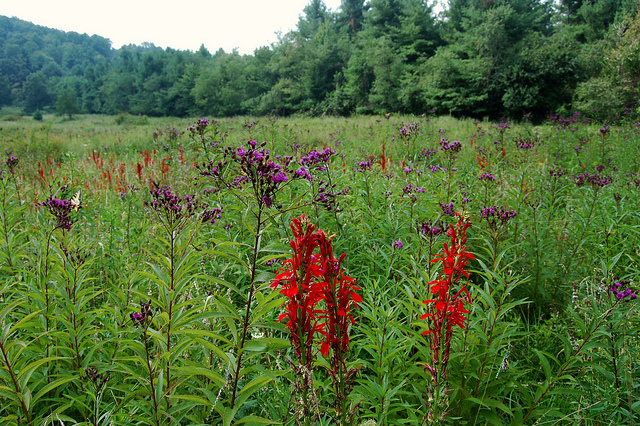 I just wanted to shout an amen to brother George Ellison’s August 10, 2011 Back Then column, “Late summer is an awesome time to botanize.” I am a big fan of a couple of those late summer beauties – cardinal flower and ironweed. 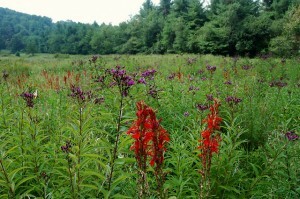 When it comes to red, few plants can match the intense, rich, velvet-red of the cardinal flower. Lobelia cardinalis was named after the Belgian botanist Mathias de L’Obel who often used the “Latinized” form of his name — Lobelius. The species name, cardinalis was inspired by the red of the Roman Catholic Cardinals’ robes. It was officially named from specimen collected in Canada in the mid 1620s. Cardinal flower grows from two to four feet tall. The flowering spike that tops the plant may reach two feet or more in length. The crimson blossoms open from the bottom up and blooms can continue for weeks. The petals are united to create a two-lipped corolla. The Cherokee and other Indian tribes used cardinal flower both medicinally and for ceremonies. One of the common names for the plant is Indian tobacco and while it does have medicinal qualities it can also be quite toxic. Extracts from the leaves and fruits of cardinal flower can cause sweating, vomiting, severe pain and even death. So, unless you know what you’re doing it’s probably best to just enjoy the beauty of this wild jewel. Cardinal flowers make great additions to hummingbird and/or butterfly gardens. Ruby-throated humming birds are one of the primary pollinators of cardinal flower. I have had my eye on a small stand of cardinal flower growing at the edge of the woods on the road to my home for several years. When I first noticed it years ago there were two or three plants. It would occasionally double in size but then return to just a couple of stalks. But this year the size of the stand has more than doubled and there are a dozen or more of the rich velvet-red spikes glowing from the forest shadows. Cardinal flower is often marketed as a perennial but it isn’t. Individual plants may live for a number of years but they eventually die. However, new shoots generally grow, from the axils of the lower most leaves and usually put down roots before the original plant dies. It is, of course, also propagated by seeds. Another favorite of mine that George mentioned in his column, New York ironweed, Vernonia noveboracensis, is also found in a couple of spots along the shoulder of the road to my house but it is much more common in meadows, open fields or waste areas, especially those that are moist. New York ironweed can grow up to 6 to 10 feet tall and instead of a spike, it’s flowers are found in a kind of round, flat-topped inflorescence called a corymb. The flowers at the outside of the corymb open first and then blooming progresses to the center. New York ironweed, like cardinal flower blooms for a long period. The flowers are most often a deep rich purple but, occasionally, can lean to the bluish-lavender side. Ironweed is also a great plant for butterfly gardens. A great place to see cardinal flower and ironweed together with some Joe-pye and goldenrod thrown in as lagniappe is at the intersection of Bethel Road (U.S. 276) and Raccoon Road just outside of Waynesville.